We have several March birthdays in our family, but each person chooses his/her own birthday dessert. 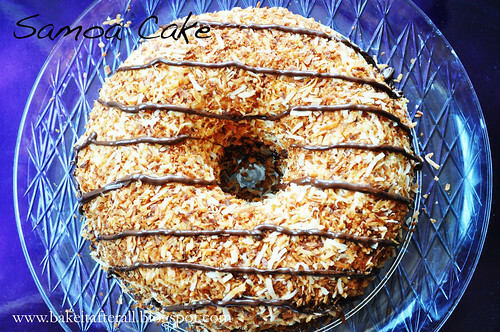 A couple years ago, I was designated to make my sister's dessert, and she chose this Samoa Bundt Cake inspired by one of my favorite Girl Scout Cookies. It looked a little overwhelming at first, having two batters and a homemade dulce de leche frosting, but I was up for the challenge. And let me say, this cake was worth it! I received so many compliments on it. I thought the frosting/coconut combination was incredible even without the cake and could be added to any cake, so if you're looking to cut corners and want to make a simpler cake batter (or even use a boxed mix! ), I think spending the time to make the frosting is well worth it! I might suggest a chocolate boxed cake with this frosting and toppings! Love Samoas? Check out these Samoa Bars! Note: Read the entire recipe before you begin. You will need to prepare a batch of dulce de leche and allow it to cool completely before making the frosting for this cake. Prepare dulce de leche, if needed. Let cool completely. 1. For each batter, beat butter or oil and sugar(s) on medium-high speed until fluffy. Add in eggs one at a time, mixing well after each addition. Add milk and vanilla (if applicable) and mix until well combined. 2. In a separate bowl, sift together the dry ingredients for each batter. 3. Add the dry ingredients to the wet ingredients slowly and mix until well combined. 4. For Batter #2, add the boiling water at this step. 5. 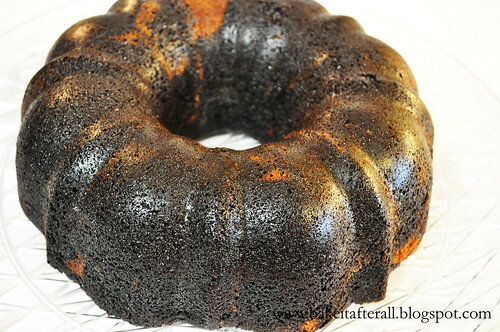 Grease and flour the bundt pan well. Layer the cake pouring some of each batter and alternating layers until both batters are completely transferred to the pan. Tap the bundt pan on the counter a couple of times to remove any bubbles. 6. Bake approximately 1 hour or until a skewer inserted in the center comes out clean. (Mine took about 50 minutes). 7. Let the cake cool completely. 1. To toast coconut, place on a cookie sheet in the oven at 350 degrees, tossing occasionally, or in a dry skillet stirring constantly until desired color is achieved. 2. Beat the cooled dulce de leche, butter, powdered sugar, vanilla and salt for 3 minutes. Add in 1 cup toasted coconut. Chill for 1 hour. 3. 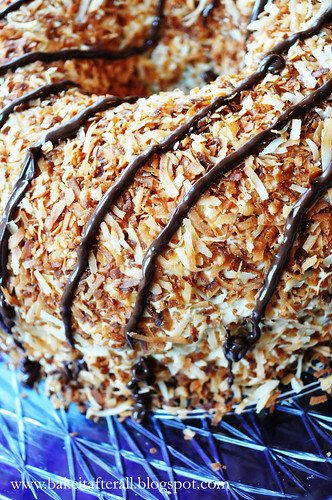 Frost the cake with the frosting, and top with the remaining toasted coconut. 4. Melt the chocolate chips in the microwave and place in a pastry bag with a small tip or in a ziploc bag with a corner cut off. Drizzle stripes on the cake.